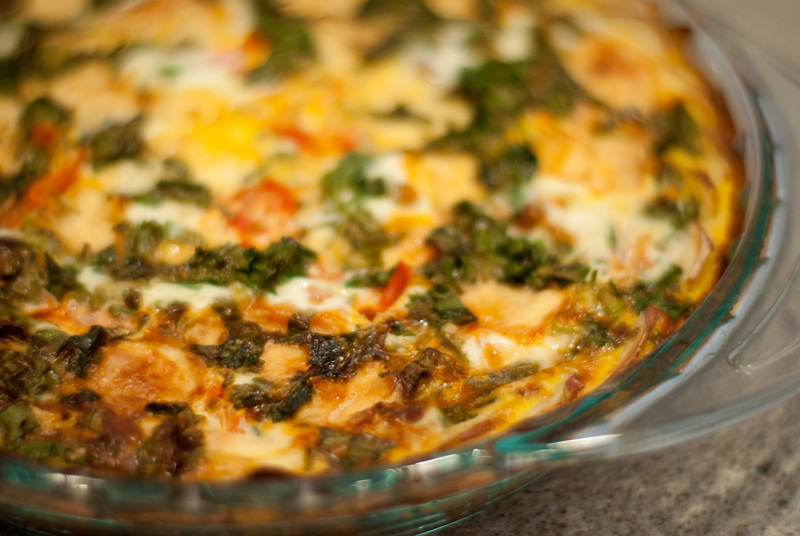 chorizo & cilantro quiche | gluten-free glory! I am a creature of habit. This month, in an effort to get more protein in the mornings, and have a quick-and-easy, no-prep option for breakfast, I’ve been making quiche. The eggs, milk, and cheese are all great protein sources, quiche is good warm or cold, and it’s so easy to slice up as much as I’m hungry for. Better yet? I don’t have to wash dishes every single morning! Big like. I posted my crustless butternut squash quiche a couple of weeks ago, then made this one two weeks in a row. I held off making it for a third week because – c’mon now – that would be overkill. But I will definitely make it again, probably the next time I have chorizo and cilantro lying around waiting to be used up. Serves 4-6, or 1 every morning for a week! Remove chorizo from casing. Crumble and brown (like ground beef) in a skillet on medium heat. Remove from heat and set aside. Halve and quarter both potatoes lengthwise. Thinly slice and arrange in a thin layer on the bottom and sides of a 9 1/2″ pie plate. Layer chorizo, green onions, tomato, cheese, and cilantro in pie plate, on top of potato crust. In a medium bowl, whisk eggs, milk (start with 1/2 a cup), and ground pepper to combine. Pour into pie plate over quiche ingredients. The liquid ingredients should fill the pie plate, close or right up to the top of your potato crust. If you need more liquid, whisk another egg or two with a few tablespoons of milk and pour over quiche. Bake for 30-35 minutes, until quiche is lightly browned and a clean knife inserted in the middle comes out clean. Serve warm or cold with sliced avocado.